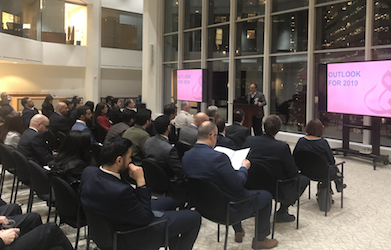 Amer Bisat, Managing Director, Head of Emerging Markets Crossover Team and Portfolio Manager at BlackRock, started off the evening by sharing his insights on emerging markets and the status of the economy in the EU, the US, China and MENA amidst rapidly changing geopolitics. Mahmoud Mamdani, ABANA Chair shared a brief overview of the organization’s accomplishments in 2018 and upcoming projects in 2019. ABANA Board Members, Samaa Haridi, Lotfi Karoui and Hani Beyhum presented ABANA’s year-end reports, which included highlights from 2018 with regards to our programs, finances and organizational structure. Additionally, ABANA Board Member Abbas (Eddy) Zuaiter shared with our guests his projections for ABANA in the new year. Finally, the association’s Board of Directors re-elected Mahmoud Mamdani, Vice Chairman and Managing Director, Investment Banking Division at Morgan Stanley, to serve as ABANA Chair in 2019.